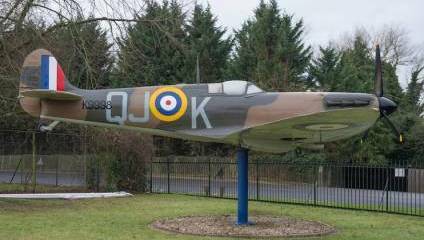 The brand new Biggin Hill Memorial Museum opened its doors this February, offering visitors the chance to experience the inspirational history of Britain’s most famous airfield. The museum, which includes St. George's RAF Chapel of Remembrance, the moving memorial to the 454 pilots killed flying from RAF Biggin Hill during the Second World War, will tell the story of Biggin Hill through the experiences of the people who served and lived there. From the fighter pilots facing the realities of aerial combat, the local pub landlady creating a sense of normality, to children scavenging souvenirs from the battles overhead, the story told by the museum is above all about the people of Biggin Hill. More than 80 exhibits are included in the interactive, multimedia display and a diverse and unique array of objects will bring the personal stories to life, from a 50kg unguided bomb (not active) and the Biggin Hill ‘Scramble’ and ‘Victory’ bells, to a Luftwaffe tea set and the table from a local pub that had fighter pilots’ names carved into the wood. Audio guide commentary is led by historian Dan Snow, who is joined by the voices of veterans including the late Geoffrey Wellum (the youngest Spitfire pilot to fly in the Battle of Britain at just 19 years of age) and Tom Neil.